Will 2011 be the year of mobile computing in India? Two interesting pieces of news inspired this post. Engadget reported IDC figures citing that in Q42010, smartphone shipments overtook PC shipments for the first time. Globally, approximately 100 million smartphones shipped in Q4 2010, as against 92 million PCs. Secondly, Gizmodo pointed out that the 5 global best selling handsets in Q4 were all smartphones. (The Apple iPhone 4 tops the list, which also includes the iPhone 3GS and the Motorola Droid). Analysts at Gartner and other companies have been predicting that the future of computing lies in handhelds like smartphones and tablets, rather than laptops or desktop PCs. In fact, Gartner has recently lowered their PC sales forecast for 2011 and 2012 based on the consumer enthusiasm for tablets and smartphones. To quote George Shiffler, Research Director at Gartner, "..We now believe that consumers are not only likely to forgo additional mobile PC buys but are also likely to extend the lifetimes of the mobile PCs they retain as they adopt media tablets and other mobile PC alternatives as their primary mobile device". Basically, this does not mean that people have no further use for their PCs - it means that they will delay replacement purchases of PCs and instead invest in mobile handheld devices through which they will increasingly spend more time accessing the internet. This infographic posted on Engadget (source : RBC Capital Markets) gives a different picture of the situation, showing that in a world with 5 billion mobile phones and more than 1 billion PCs, the smartphone and tablet numbers are still a drop in the ocean. Definitely this perspective makes more sense for India, which is not yet a 'mature' market for either PCs or smartphones. What is the future forecast for India in terms of mobile computing? Some figures at Trak.in reveal that the notebook market in India is growing steadily while the desktop market has plateaued. The graph below shows laptop/netbook sales have tripled over the last 4 years, touching 2.5 million units in 2010. In contrast, the desktop sales have remained more or less stagnant at 5 million units. So what would be the future trends for handhelds vs. PCs in India? This study conducted by Intel-IMRB and published on Watblog) suggests that urban penetration of PCs is only 28 million.Rural penetration is likely to be much less.Therefore it seems logical that the number will increase, especially as laptop prices drop. Gartner reported that in Q4 2010, the Indian PC market grew at 16%, which is more than the global growth rate. However, it is piquant to note that teledensity of mobile phones is 65% plus (700 million plus users) and and every month, we add more mobile users than the entire PC market! Therefore it seems more likely that the mobile phone (as opposed to the smartphone) will become the device of choice for internet access. Nowadays, even entry level handsets made by companies like Micromax or Karbonn, come equipped with browsers and GPRS/ 3G capabilities. 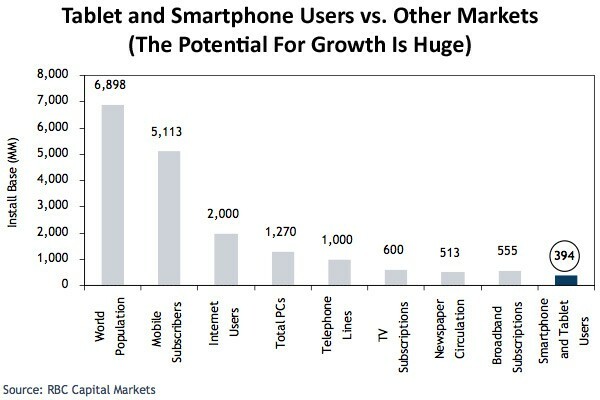 It should be noted that smartphones are growing in India. IDC India reports that 6 million smartphones were sold in 2010. This may be a drop in the ocean compared to the overall subscriber base, but still consider that more smartphones were sold last year than desktops! However, it is possible that smartphones may not grow at the dramatic pace that they have, say in the US. Operators in the US subsidise smartphones aggressively to tempt consumers, because they stand to benefit from the increased data usage on these devices. In India, where phones are sold unlocked, the price gap between dumbphones and smartphones continues to be huge, though brands like Micromax and Huawei have started to bridge it. But the presence of the world's leading smartphone brands continues to be miniscule; of the top 5 global handsets that I mentioned last year, 4 are not even launched yet in India! So handhelds will power the internet revolution in India, but it will be sometime before smartphones and tablets become the next big thing. And Android should grow, but perhaps not the massive 615% growth we saw globally in 2010. India is still very much the market of Nokia, to an extent Samsung, and of course the cheap local brands. Let's see how that picture changes over the next few years! I too feel that one should not just replace a pc or a laptop with a new one with better spec; if they are in working condition, one should go for complementing devices - tablet / smartphone and distribute the work on that device which is easy and convenient to use. After Samsung's galaxy tab , thetablet pc, laptop and mobile users in India are continously increasing and keeping in mind the user's choice companies are offering them the products they would like at an affordable rate.